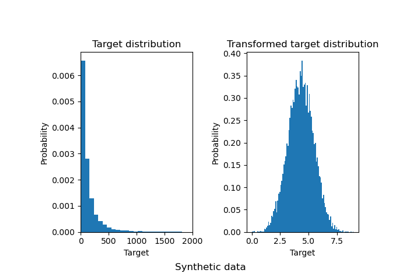 Meta-estimator to regress on a transformed target. Useful for applying a non-linear transformation in regression problems. This transformation can be given as a Transformer such as the QuantileTransformer or as a function and its inverse such as log and exp. Regressor object such as derived from RegressorMixin. This regressor will automatically be cloned each time prior to fitting. Estimator object such as derived from TransformerMixin. Cannot be set at the same time as func and inverse_func. If transformer is None as well as func and inverse_func, the transformer will be an identity transformer. Note that the transformer will be cloned during fitting. Also, the transformer is restricting y to be a numpy array. Function to apply to y before passing to fit. Cannot be set at the same time as transformer. The function needs to return a 2-dimensional array. If func is None, the function used will be the identity function. Function to apply to the prediction of the regressor. Cannot be set at the same time as transformer as well. The function needs to return a 2-dimensional array. The inverse function is used to return predictions to the same space of the original training labels. Whether to check that transform followed by inverse_transform or func followed by inverse_func leads to the original targets. Transformer used in fit and predict. Internally, the target y is always converted into a 2-dimensional array to be used by scikit-learn transformers. At the time of prediction, the output will be reshaped to a have the same number of dimensions as y.
fit(self, X, y[, sample_weight]) Fit the model according to the given training data. predict(self, X) Predict using the base regressor, applying inverse. Array of weights that are assigned to individual samples. If not provided, then each sample is given unit weight. Predict using the base regressor, applying inverse. The regressor is used to predict and the inverse_func or inverse_transform is applied before returning the prediction.